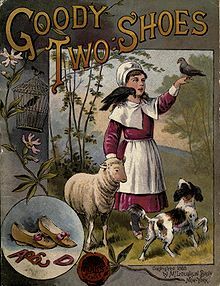 This week I was looking up where the expression “goody two-shoes” originated. A friend used it in conversation and I remarked or rather asked whether or not this is even used anymore. 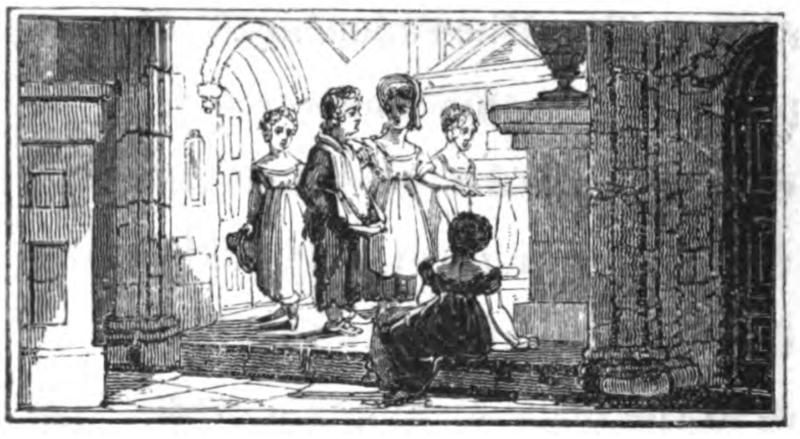 I was fascinated to learn that the phrase comes from an eighteenth century children’s book–another example of how the century continues to creep into our own popular culture. 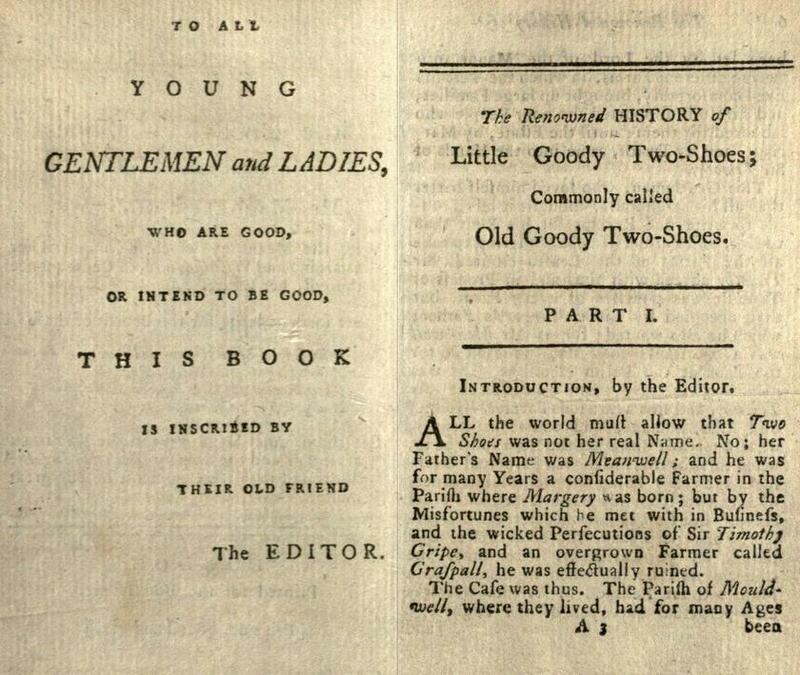 The History of Little Goody Two Shoes (1765) was published anonymously but is most often attributed to John Newberry, the book’s publisher, or to Irish novelist and poet Oliver Goldsmith. The title went through thirty editions by 1800. Looking back at recent posts, the blog has gradually been shifting to reviews, tributes and “on this date in history” articles while I work on my dissertation. This happens to be the month of the 250th Anniversary of the title…and a fitting topic for my next post. 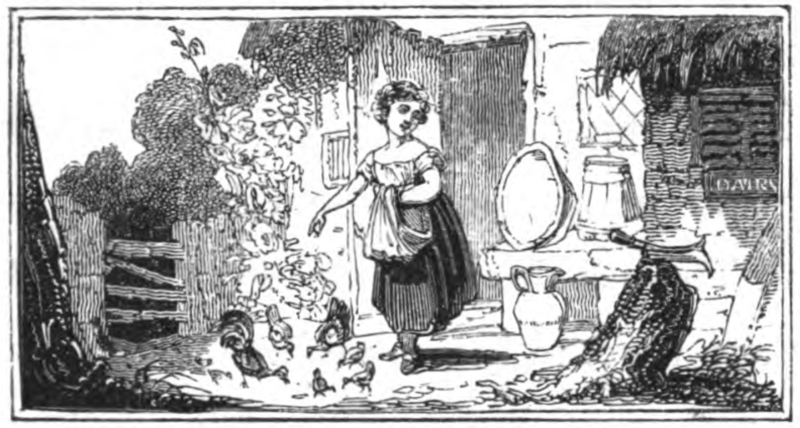 Told in iambic octameter, the tale depicts orphan Margery Meanwell, who is cast into the streets with only a single shoe. When a local vicar provides her with a new pair of shoes, Margery trumpets her good fortune–with a “two shoes, two shoes!”–everywhere she goes. The young woman is then led on a series of adventures. After learning to read and write, she dedicates her life to education youth. But in addition to her duties as governess and schoolteacher, she saves friends from murder, foils a plot to steal local treasure from group of convicts, and dedicates her time caring for animals. 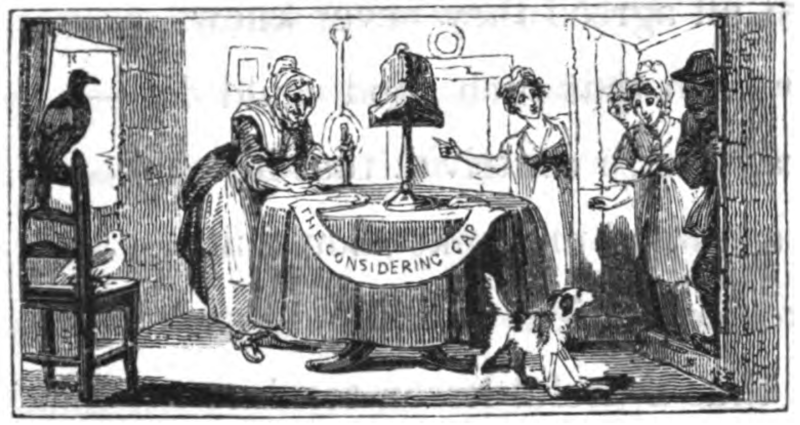 Interested in science, in one chapter she profits from her invention of what she calls “a Considering Cap.” The OED notes the first use of “a thinking cap” to a story in the Ladies’ Repository . . . over eighty years later. So perhaps this is the first thinking cap mentioned in literature? Like most moral tales, do-gooder Margery’s virtuous life is ultimately rewarded at the end of the story when she marries a wealthy widower . . . happier ever after. This entry was posted on July 8, 2015 by k.a.wisniewski in Books/Book-making, Children's Literature, Reviews and tagged Literature.